Note: Maybelline Simply Fabulous contest will be ending today, if you have not joined to win some goodies, click here! I love french tip! And I love Konad too! So, i have tried a way to incorporate Konad into french tip, and at the same time trying to keep the edge as neat as possible. Using french sticker, color the nail at the outer edge. In this nail, I am using Stage polish – Alluring. Then, with Konad plate M62, I printed a layer over the french tip. DO NOT peel off the sticker will it is completely dried and done. Wait for it to dry thoroughly then peel off. I was in a hurry to go out and had no time to wait, so you can actually see the smudges on the edge. Somehow this zebra tips didn’t turn out as pretty as I had imagined. It looks…errr rather hideous. I am sure it would be better right? If you are interested to see what are the other prints on M62, click here! how does your plate look like? it’s so unique and pretty! LyNn: the plate is > http://prettybeautiful.net/notd-konad-tip-with-plate-m62-with-stage-nail-polish/ i love the plate! Nikki: thanks sis! now i think white should always go with striking color, perhaps the cherry blossoms combo! It looks pretty, and I love your blog lay out! That’s nice. I am really, really, very inspired to do my own nails after reading many of your posts. Only done two really simple one so far. And one of them got compliments from many people. 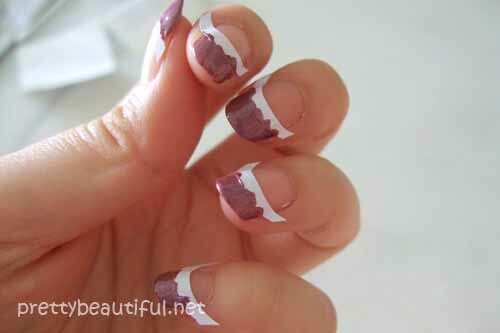 Thanks so much for all the nail-art how-to. Jyoan: thank u so much for yr words too! 🙂 i certainly hope i am able to share and inspire some people to start their own nail art, need not go for mani padi 🙂 can’t wait to see your creations too. Wooow! Looks so stunning! Love this zebra nail tips! hi pls tell me where did u get this konad stamping nail art?is there any at syngei wang plaza?thanks a lot! Next post: The Winners of Maybelline Simply Fabulous are….